Okan is a restaurant in Bricton Village with little decoration except some Japanese lanterns. Half the inside is taken up with a counter on which the two (or sometimes three) chefs prepare your food hot and straight from the griddle. The remainder are tables and stools as there is no space for a chair. Sharing tables is a must, especially at the peak times (7.15 to 8.15) but that only adds to the atmosphere and allows you to peer at your neighbour’s food before making a decision. There is no chance of not seeing the food and every chance you might put your elbow in it as the space is very, very tight. I must have apologised or been apologised to several times while in there for a little under an hour. 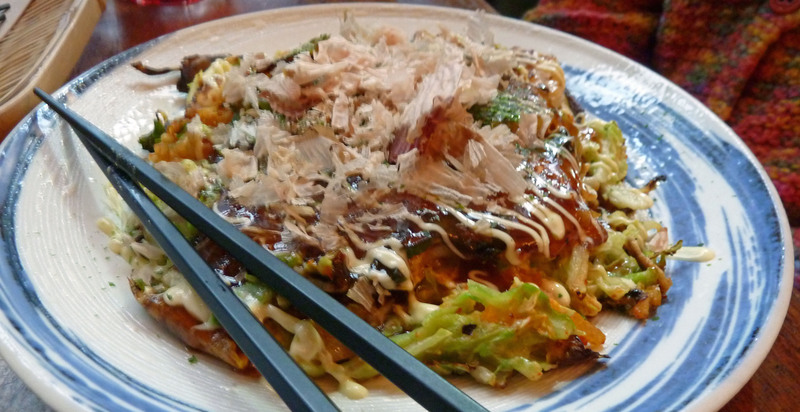 Okan specialises in one type of food – Okonomiyaki. We were holding back on visiting this restaurant as we have had heard widely differing views and we were also not sure we were up to cabbage omelets. But this Japanese fast food restaurant actually serves a cabbage pancake which is street food in Osaka. It is served with a special brown sauce (we weren’t brave enough to ask what it was), Japanese mayonnaise, green seaweed and bonito shavings (for added salt we assume) and has a variety of toppings. 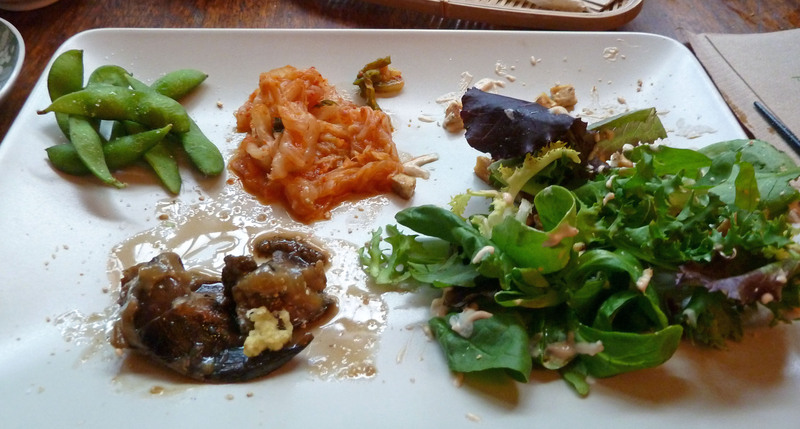 We chose the “special”- kimchi, prawn, corn and squid and other was kimchi with pork. This is a fast food restaurant and it lives up to its name. If we hadn’t had the starter we would have made it out in about 25 minutes. Sometimes that’s good and sometimes you want to relax a bit. The main courses came piping hot and it takes time to eat it because it needs a bit of cooling, particularly when you are eating with chopsticks. Again we enjoyed the pancakes. They were soft but with a bit of a crunch from cabbage which isn’t slimy. 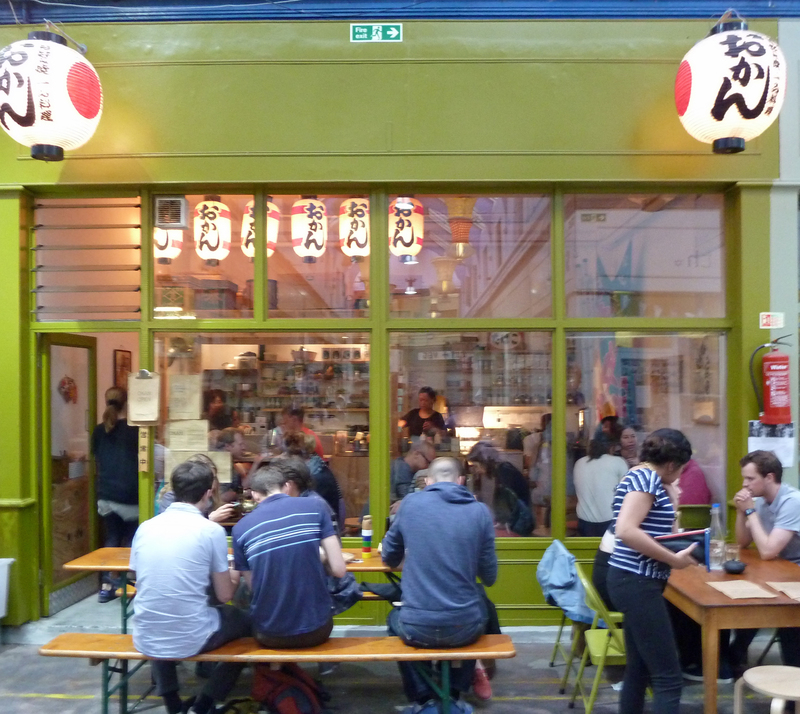 For those who do not have to courage to break out with a pancake there are safer options like yaki soba noodles which our dinner companions ordered and reported were also delicious. They have a drinks menu including alcohol. There are three types of Japanese beer, three of saki and three of tea and a variety of soft drinks. The smoky but relaxing tea (Houji) didn’t really live up to its promise but came piping hot in a lovely little teapot. 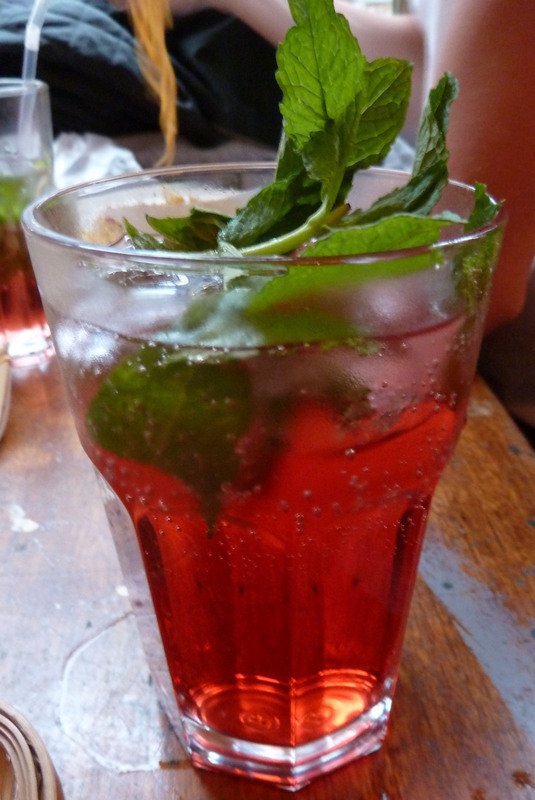 The cranberry and fresh mint was refreshing and came cold with a lot of ice. Everyone welcomed us and said goodbye (although I did crave a Japanese welcome). The service was attentive, although our first course went to the next table. But we were able to spot it easily as the bemused customers asked what it was. Portions are fairly large but not cheap – £8.25 for the Okan special which had a lot of prawns but not much squid. The total bill was £28.15 for two. We would go again but it isn’t for a leisurely meal and there is no booking. As usual with restaurants in the Village they are only open Wednesday to Sunday and only in the evening on Thursday to Saturday. Bring cash as no credit cards are taken and we had to sort through our pockets before we could order.